Tobacco Dock in London held a massive Indie gaming event - EGX Rezzed - that I was lucky enough to visit. More than 200 games were on show from a variety of developers. With so much to see, it can be a little overwhelming when deciding what to look out for and which games are the ones to watch. However, a handful of titles have stuck with me since attending the event. Let me count down 5 awesome, upcoming Switch titles to keep your eye on. Flipping Death is a game by Swedish developers Zoink! Known for Fe and Stick It To The Man, Zoink show no signs of slowing down and always have something in the works that'll catch your attention. Flipping Death is a spiritual successor to Stick It To The Man, with full-on comical writing, a unique hand-drawn art style and light platforming elements. Penny - the main character - is dead, and somehow becomes Death's new assistant. If this hasn’t drawn you in yet, then I don’t know what will. Flipping the world between a realm of dead and living, and possessing various characters is a unique way of evolving the point and click adventure genre. So if you're after something silly to make your sides split, this is for you! Easily the most adult-themed game on this list, Travis Strikes Again offers an attitude like no other. The snippet of gameplay I got to experience saw me battle through a single level before tackling an intense boss fight, though the final game will have a lot more variety. Sucked into a game console called the Death Drive, you’ll be taking control of Travis as he fights his way through 7 different game genres, all inspired by various indie titles. If you know me, then you know I love my indies, and to have a bunch of them rolled into a No More Heroes game, is kind of a dream come true. Couple that with two player co-op, with each player using a single Joy-Con, and you're almost at pure bliss. Noir, greyscale, black and white, however you choose to describe the visuals of Shift Quantum, you’ll never escape the pure puzzling pleasure that's ever-present. Imagine flipping the world upside down and every platform is now open air, and the skies are now platforms. That’s the gist of the main mechanic here, but there are a number of other elements piled high on top of this. Switches that rotate the level, fans that push you around with mighty gushes of air, and grinding digger blocks that let you plough through the land. All these are just some of the interesting ways that this game keeps your mind active. Did I mention that it comes with a level editor too!? Definitely shaping up to be one of the greatest puzzle games of the year. Vikings are invading your small island in this real time strategy. Stripped back to the bare bones of the genre, Bad North is both easily accessible and hard to master at the same time. Making every move count is important, as you’ll be watching your people fall on the battle field with every mistake. The beautiful, clean-cut isometric art style and pure strategic fun made Bad North catch my eye straight away, so be sure to keep yours peeled for the launch. Remember the feeling of of growing up and playing awesome space shooters? 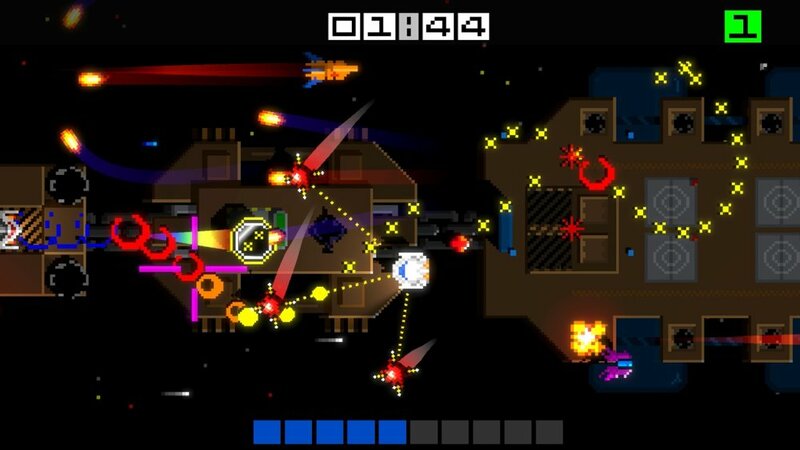 Sharp, bright colours and incredibly tight action, with the smallest mistake leading to death - these are the gaming memories that I’m most fond of, and it’s these retro throwbacks that drew me towards Hyper Sentinel. When it was showcased months ago on a Nintendo Direct I instantly took a bit of a shine to its pixelated madness. Getting hands on with it brought back fond memories of being a child, grinding away on my Commodore 64. The big difference is where Hyper Sentinel looks retro (and most definitely has gameplay elements inspired by the shmups of yore), it’s also equipped with some modern flare. This arcade style space shooter is right around the corner, and I can't wait to jump back into it's onslaught of bullet-spewing enemies.